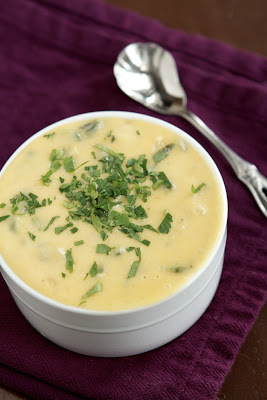 Roasted Poblano and Potato Soup | Naturally. My brain has ceased functioning in normal capacity. In fact, I really shouldn’t be writing a post in this state- who knows what I will type or what kind of mistakes I will make. This event keeps us running from now until late Saturday night. I love being busy but I always have ten things going at once. I woke up at four this morning to write down things I needed to do today but I didn’t want to leave my bed, so I wrote them in highlighter (the closest thing to my bed.) Turns out, I can’t read highlighter very well. I want a bowl of this soup right now. In fact, I would hire someone to make me this soup right now. Unfortunately, no one around me cooks. In a large pot, heat oil over medium-low heat and saute the onion and garlic until the onion is translucent. Add in potatoes and veggie broth (enough to cover the potatoes), increasing the heat and bring the broth to a boil. Reduce to a simmer and let cook until potatoes are tender. At this point if you like chunks of potatoes in your soup, reserve 1/4 of the cooked potatoes. With the remaining potatoes/broth, use an immersion blender and puree the potatoes-set aside. In another pot, heat butter over medium-low heat. Remove skin from the roasted pepper, dice, and add to the butter. Whisk in flour and continue to cook for two more minutes to cook out the flour taste. Finally, whisk in milk and continue to cook until the mixture thickens. Add in potatoes (chunked and pureed) and cheese. If soup seems too thick, add in a little more milk to thin it down. Top with cheese, extra pepper, or cilantro. Good luck this weekend! Sounds intense…. This soup, on the other hand, sounds amazing. LOVE the poblano/potato combo! I made this soup today and it was SO GOOD! thank you! 🙂 I never met a soup that didn’t taste better the second day. I think you would be fine to make it ahead of time! This is so good! I got a bag full of roasted poblanos from my farmers’ market but I wasn’t exactly sure what to do with it. This soup looked perfect. I veganized it easily (I used Daiya pepperjack for the cheese part) and it was so easy and delicious. Thank you! This is my go to potato soup recipie, actually, I use the base for this soup for all of my other soups. It’s so simple, hearty and completely lovely when the weather is cold. We don’t add cheese becasue we found it was perfect just the way it was. 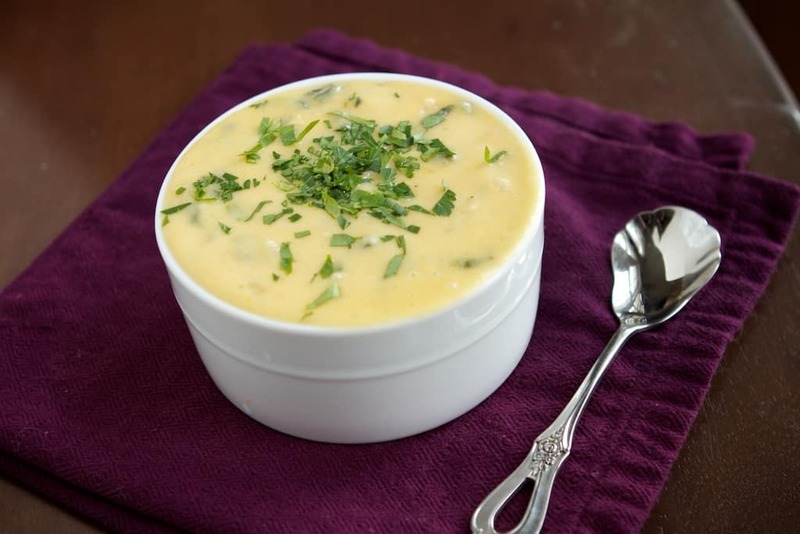 Canned potato soup will never be the same.